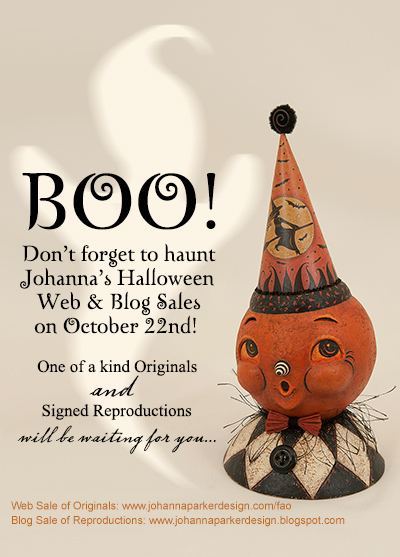 I invite you to haunt my Halloween Blog Sale here tonight, starting at 8:30 pm EST. Please refresh your browser at that time to see what I have in store. I'll have a variety of signed reproduction sets for the Halloween season. Quantities of each set are limited, and some of the items are limited edition characters. All of my designs will arrive signed as well. If something interests you, just EMAIL ME and include the name of the set you are interested in along with your name and shipping address. Sets will be reserved in the order of email requests received. Also, if you are interested in collecting a one of a kind Halloween original, make sure to visit my Folk Art Originals page on my website - same bat time!